Set in sprawling public gardens, the museum stands with its head held high in dignity. With its unique structure, style and colour, this Indo-Saracenic structure is a sight to behold. It follows a specific geographic brickwork pattern and colour combination. Hewn stone bricks have been used to build the corners while the walls are made of burnt bricks. Every nook and corner of the building reflects Kerala’s rich architectural legacy. This magnificent structure in shades of red is ornamented with stained glass windows and four huge watch towers that follow a specific colour pattern. The lush landscape that surrounds the museum offers one with a pleasant ambience for an evening walk or a day out with friends and family. Built in an Indo-Saracenic style, this regal structure is a harmonious unification of Indo- Islamic, Indian elements and Gothic architecture. 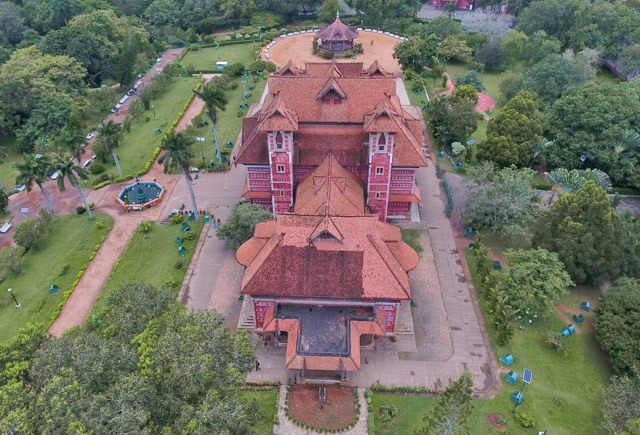 Kerala architectural style is influenced by Mughal, Italian, and Chinese architecture. In the museum a blend of all these styles can be seen. Inside the museum there are three big halls connected by long corridors with walls creatively painted in light blue, yellow and red. The arches are coloured in yellow along with red and white patterns. 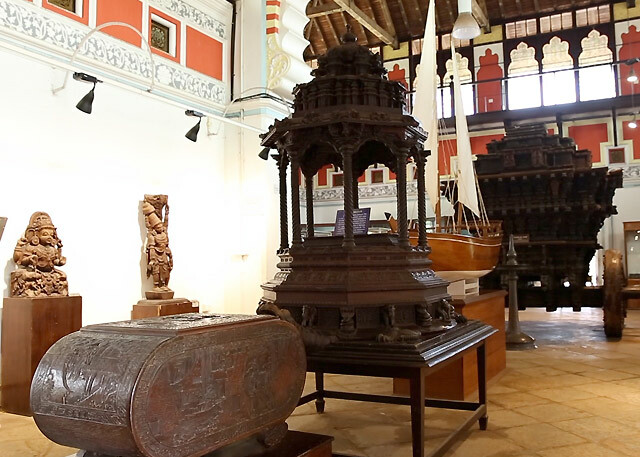 The museum has four towers which once gave the visitors a beautiful glimpse of the Thiruvananthapuram city. There is a narrow spiral stair way (now visitors are not allowed here) to reach the top of the tower. An amazing fact about the museum is its natural air conditioning effect. The double walls with ventilation provide this effect. The sliding doors are another notable feature. The building constructed with porticos at the eastern and western ends has a spacious central hall 70'x40’ at its broadest point with wide entrance steps facing north and is connected by wide corridors 45’x20’ to two halls 50’x30’ at either end. Both the central hall and the side halls have balconies with carvings and decorations. Vibrance with a tinge of elegance - such is the beauty of the windows. Hues of the windows give an artistic feel to the light that enters inside. Wide balconies at both the sides add to the beauty of the interiors. These beautiful wooden balconies enhance the classic richness of the museum. They are also decked with handcrafted designs. The wide balconies that flank the hall, the royal emblem of Travancore, Valampiri Shanku (conch shell) and the stained windows that adorn the interiors, all lend to the magnificence. The museum is also noted for its wooden beams and panels with fascinating hand painted floral designs and patterns. These beams with intricate carvings are supported by wooden corbels modelled in the form of a dragon or Yali. The statues and exquisite figures of Goddesses adorn the sill above the doors. The ceilings are painted with vibrant designs and the gable roofs are decked with stones. The beams and cross-beams made of teakwood have golden inlays that shine in the light. The colourful frescoes, Gothic roofs, and minarets are the other major attractions of the unique structure.